The other day I was gifted a massive amount of delicious tangerines. Literally tangerines for daaaaaaays… After juicing most of them I still had some left and suddenly remembered that a reader asked for a tangerine cake a little while back. 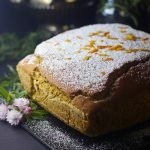 The specific request was for a vegan version of the tangerine cake her mother used to make, the traditional kind with tangerine juice and zest. 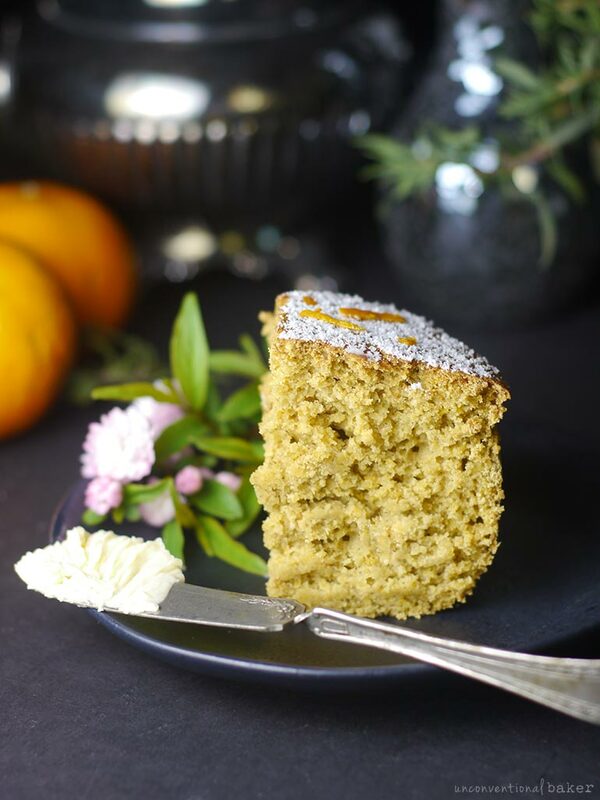 I actually already have a cake just like that on the blog…only it’s orange-flavored, but the orange juice and zest can be easily swapped for tangerine juice and you’re good to go. 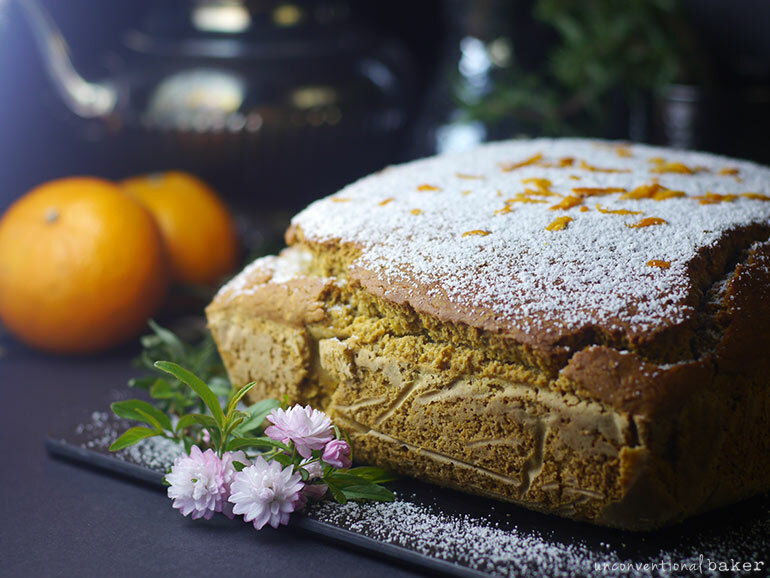 If you’re curious for that alternative, check out this oldie orange butter cake with warm orange sauce. I decided to play around anyways and make an alternative tangerine cake and ended up with this delicious treat as a result. 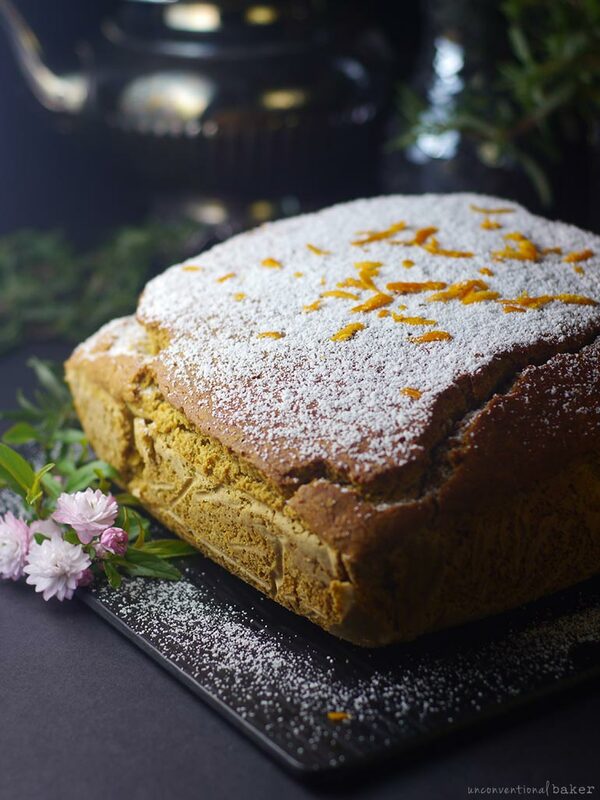 I made this cake with my pumpkin molasses muffins recipe as the base to try and make an oil-free version (since the other cake is, well, a butter cake, and isn’t super friendly to my oil-free peeps here, so I thought to try an alternative). The result is a very bready cake (in a good way!). The texture of this cake is very much like a coffee cake, although I hesitated to call it that because every time I do, non-North Americans ask where the coffee is :). But think of a dense, quick bread-like, cinnamony, flavorful cake that goes well with a good cup of tea or coffee. That’s this cake right here in a nut shell. However, if you are an oil-free-er (or maybe just a jam-lover), then at least add some jam to the cake. It goes great with apricot jam (or really any jam of your choice). It just needs that extra little something to round it off. Last but not least, cake size. Though this cake is made in an 8″ x 8″ pan, the end result is surprisingly large. It doubles in height as it bakes. Technically I think it should have been baked in a slightly larger pan, but this is what I had to work with and I don’t mind the final and more rustic “bready cracked top” look of the cake, especially once you dust it with some coconut milk powder. It also made me think that as an alternative the recipe could be halved and baked into a loaf in a large bread pan (or just bake 2 loaves if you prefer to keep the recipe proportions as is). Just keep in mind that if you change the pan sizes you’ll likely need to adjust the baking time (smaller cake = slightly less time baking, larger cake = potentially longer time in the oven). 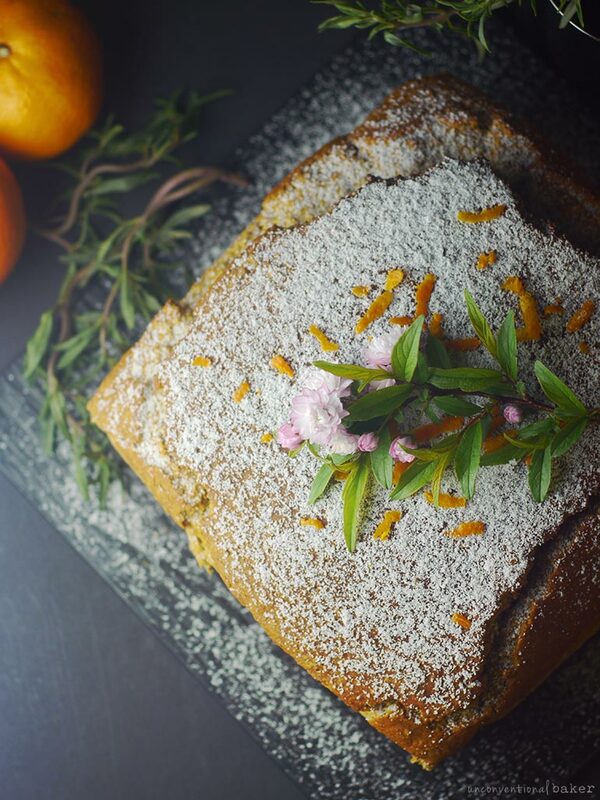 This flavorful, bread-like, warmly spiced gluten-free vegan tangerine cake is the perfect accompaniment to a cup of tea or coffee. 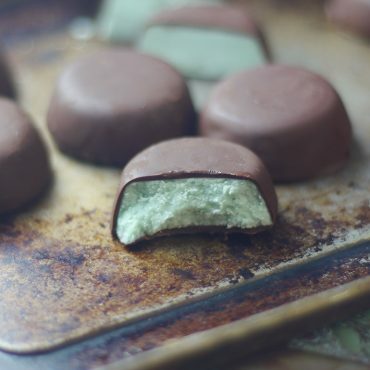 This recipe is also refined sugar-free, nut-free, and oil-free. 1. Pre-heat the oven to 350F. Line an 8″ x 8″ dish (or a dish of a similar size) with parchment paper and set aside. 2. Briefly process all dry ingredients in a food processor to combine. Transfer to a small bowl and set aside. 3. Add peeled and seeded tangerines and the tangerine zest to the food processor and process until combined into a pulpy puree. 4. Add all remaining wet ingredients and process to combine. Then add the dry ingredient mix (the one made in step 2) and process to combine once again. 5. Pour the mixture into the prepared pan and bake in a pre-heated oven for approximately 1 hour and 5 mins (or until a toothpick inserted in the center comes out dry and the cake looks nicely golden). 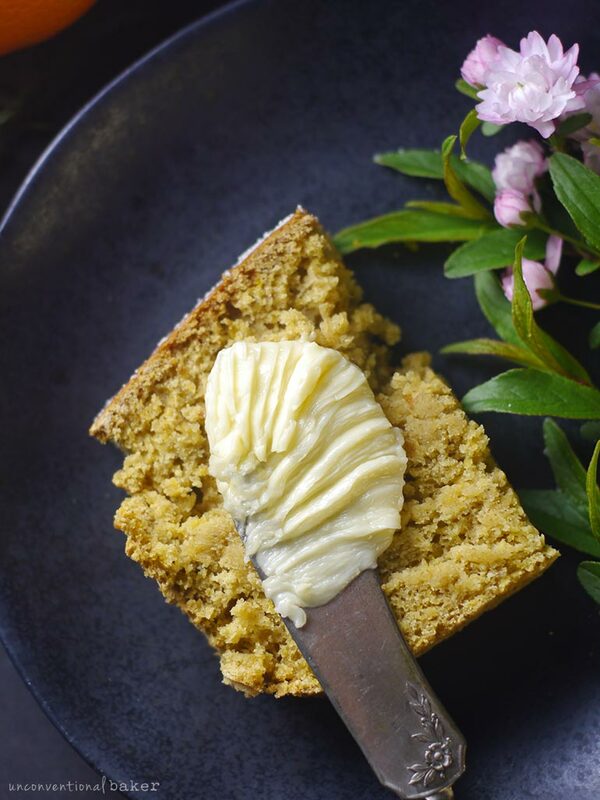 Remove from oven and cool on a wire rack for 15 mins, then remove from the pan and allow the cake to cool through or enjoy warm with a pat of non-dairy butter (or jam as an alternative). * Unfortunately I don’t know of a suitable solution for the oats in this recipe. If you’re interested in a similar cake however that’s oat-free, see this recipe instead (which can be modified to use tangerine juice / zest in place of oranges). ** Brown rice flour works well as an alternative. *** Tapioca starch works well as an alternative. **** I used zest of three tangerines, but I think can easily add the zest of all 4. I was worried about the 3 potentially adding too much bitterness, but the flavor was lovely and I think the cake can take a bit more zest if you want to amplify the flavor even more. ***** The tangerines I used were 156 – 160 grams each. Once blended (step 3) I ended up with 2 cups of blended tangerine mixture (before adding remaining wet ingredients). ****** I used the coconut water leftover from canned full fat coconut milk (which is usually a mix of coconut water with the tiniest amount of guar gum that’s left over once the cream is separated out). If that alternative doesn’t work, feel free to use light coconut milk, coconut water, or a non-dairy milk of your choice as a coconut-free alternative. ****** For the coconut milk powder, if using, be careful that the brand you purchase is actually dairy-free because some can contain dairy in addition to coconut. 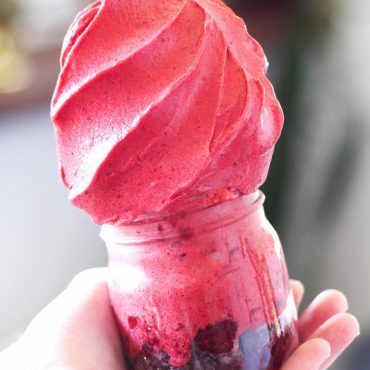 I linked in the ingredients list a brand that’s vegan so you can see an example of what to look for. Disclaimer: this post contains affiliate links to products used to make this recipe: gluten-free quick oats, white rice flour, potato starch, baking powder, baking soda, cinnamon, cardamom, salt, maple syrup, coconut water, vanilla extract, powdered coconut milk and food processor. Hi I want to try this so so bad, is there a way to make it with all purpose flour? I dont have access tu GF stuff where I live. I’m pretty sure you can replace the white rice + potato starch part with all purpose flour (I’ve had readers do that with my original muffins recipe and they mentioned it turned out great). I’d keep the quick oats though as they give the cake a lot of texture — they don’t have to be gluten-free if you’re not gluten-sensitive though. Wow, I LOVE orange-flavored cakes! Tangerine must taste even better or at least just as amazingly. Your creation looks absolutely beautiful. I’m inspired to create it now! Thanks Cassie. 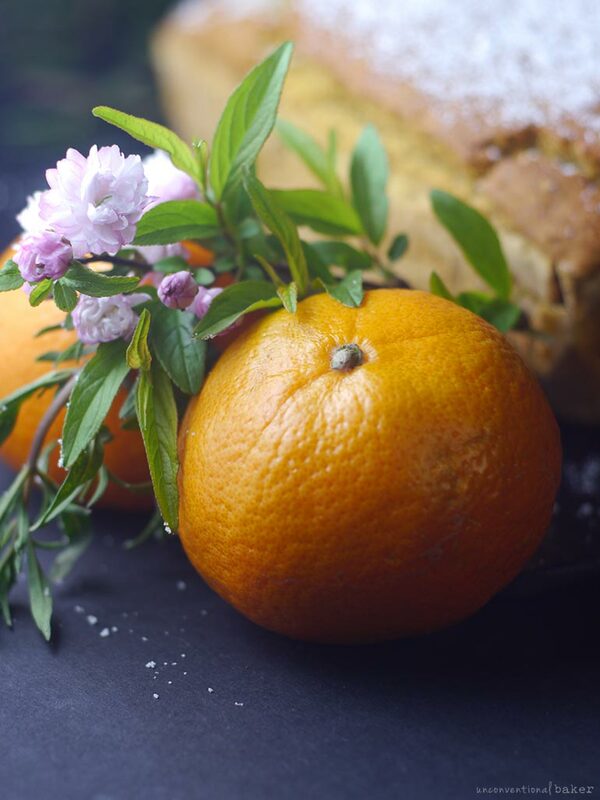 Love citrus cakes too. Thanks very much, Marc. I’ve never tried hemp porridge, but that sounds like an interesting alternative. Would love to hear how it turns out for you if you give it a go.